South Korea's Moon sent Chung and other envoys to the North Korean capital on Wednesday to set the timing and agenda for the third inter-Korean summit this year, and to break the impasse in talks between Washington and Pyongyang over dismantling the North's nuclear programme. South Korea's president, Moon Jae-in, will travel to North Korea for a third meeting with the country's leader, Kim Jong-un, as denuclearisation talks with the U.S. stall. 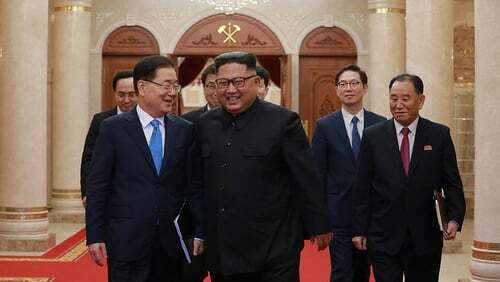 The summit - a third between the two leaders this year - will take place from September 18 to 20 and the dates were decided on Wednesday during a visit by South's national security adviser, Chung Eui-yong, to Pyongyang, where he met Kim and handed over a personal letter from Moon. Only hours earlier, a South Korean delegation returned from talks with Mr. Kim where they set up a summit for September 18-20 in Pyongyang between Mr. Kim and South Korean President Moon Jae-in, their third meeting since April. South Korea says North Korean leader Kim Jong Un told him that dismantling work at his main rocket launch site meant the "complete suspension" of all future long-range ballistic missile tests. His words were relayed by South Korean officials on Thursday, after they met with Kim in Pyongyang this week. The statement from the Korean Central News Agency wasn't new information - Kim has repeatedly declared similar intentions before - but allows hopes to rise that diplomacy can get back on track after the recriminations that followed Kim's meeting in June with US President Donald Trump in Singapore. Despite the difficulties, Chung said Kim's "trust in Trump remains unchanged". According to South Korean officials Thursday morning, Kim said he wants to denuclearize before the end of President Donald Trump's first term. "I can not reveal it here, but (Kim) asked for a message to be conveyed to the United States on the matter", Chung said. "North Korea has been preemptively carrying out measures needed for denuclearisation, and Kim said he would appreciate that such good faith is accepted with good faith". "If reciprocation is shown for North Korea's preemptive measures that have already been completed, he strongly expressed his will that more active measures for North Korea's denuclearisation can be taken". He says the Koreas will hold talks next week to prepare for the summit. But negotiations have since stalled over differences on how to implement the agreement, and amid signs of North Korea continuing with its weapons programme. North Korean Dictator Kim Jong Un is apparently still interested in peace in the Korean Peninsula. Under discussion is whether denuclearization or declaring an end to the 1950-53 Korean War should come first.